RetroTurbo Motorsport is an Authorized Reseller of GAZMATIC INTERNATIONAL. Volvo 240 Series GAZ GAI adjustable dampers. These telescopic inserts will enhance handling of your classic Volvo 240 much better than any standard shocks currently available on the market. Inserts can be custom built in various open and closed lengths and will adjust bump and rebound off a single control knob. 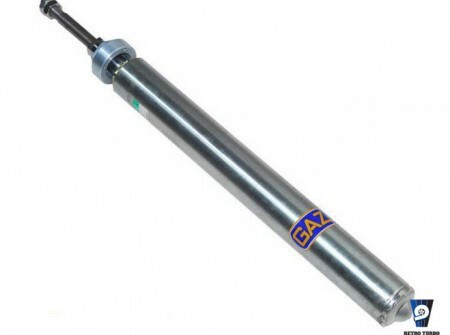 GAZ GAI series of adjustable shocks offer 20 point adjustment. … send us a question if you need different length! Let us know if you’re after shocks for GLT version before placing an order. We do offer a matching set of Volvo 240 GAZ GT rear dumpers ->here<- order both sets together to avoid delay and save £££’s on shipping! Shocks are new and come as set of two. As standard they come with 12 months GAZ warranty. These shocks are TUV certified! - Please note that dispatch time can take up to 4 weeks. - We can provide GAZ shocks for all makes and models, don’t hesitate to ask! SKU: 240GAZgaiFRONT. Category: Shocks, Volvo 240 Series Parts.